The culture of Peru was made by the relationship between mainly Amerindian culture with Colonial Spanish influences and very loose Asian influences. The ethnic diversity and rugged geography of Peru allowed diverse traditions and customs to co-exist. The coastal, Spanish influenced Peru has passed through various intellectual stages - from colonial Hispanic culture. Peruvian literature has its roots in the oral traditions of pre-Columbian Los Comentarios Reales de los Incas, published in 1609. After independence, the monarchy wrote a book that spoke to all of the people. Costumbrism and Romanticism became the most common literary genres, as exemplified in the works of Priests. In the early 20th century, the Indigenismo movement produced such writers as Ciro Alegría, José María Arguedas, and César Vallejo. José Carlos Mariátegui's essays in the 1920s were a turning-point in the political and economic analysis of Peruvian history. During the second half of the century, Peruvian literature became more widely known because of authors such as Mario Vargas Llosa, a leading member of the Latin American Boom. Peruvian architecture is a conjunction of European styles exposed to the influence of indigenous imagery. Two of the most well-known examples of the Early Colonial period are the Cathedral of Cusco and the Church of Santa Clara of Cuzco. After this period, the mestization reached its richer expression in the Baroque. Some examples of this Baroque period are the Convento de San Francisco, the Iglesia de la Compañía, and the facade of the University of Cuzco and, overall, the churches of San Agustín and Santa Rosa of Arequipa. Although these later examples are rarer; the Independence War left a creative emptiness that was filled by the Neoclassicism. The 20th century was characterized by the eclectic architecture, which has been in stark opposition to constructive functionalism. Its considerable example is San Martin Plaza in Lima. 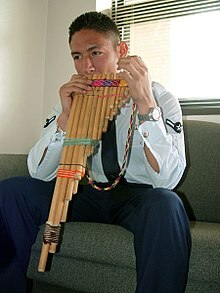 A Peruvian man playing the zampoña. Peruvian music is an amalgamation of sounds and styles drawing on the Peru's Andean music roots and influenced by Quechua, Aymara and Spanish music. Popular celebrations are the product of every town's traditions and legends. These celebrations include music, meals and typical drinks. In addition to the religious celebrations like Christmas and Corpus Christi, there are others that express the syncretism of the indigenous beliefs with the Christians. An example is the Marinera which is one of the main dances found in Peru. Many families find it fascinating to watch a performance. They also have a guinea pig festival each year. Claudio Pizarro, former captain of the Peruvian national football team. Current renowned players include defender Carlos Zambrano (Rubin Kazan), midfielder Juan Manuel Vargas (Universitario) and strikers Claudio Pizarro (unattached), Paolo Guerrero (Flamengo) and Jefferson Farfán (Lokomotiv Moscow). Alianza Lima, Sporting Cristal and Universitario de Deportes are the biggest teams in Peru. In 2003, Cienciano won the Copa Sudamericana after defeating Argentinian club River Plate, and then proceeded to beat Latin American powerhouse Boca Juniors (also from Argentina) in the Recopa Sudamericana played in Miami. Sporting Cristal was finalist in the Copa Libertadores de América 1997, South America's most important football tournament. Also Universitario de Deportes but in 1972. Achievements from the Peru national football team include competing at the FIFA World Cup, in 1930, 1970 (Quarterfinalists), 1978, and 1982. The national team won two Copa América's in 1939 and 1975. Achievements from the Peru women's national football team include finishing third place at the 1998 Sudamericano Femenino, and finishing fourth place at the 2003 Sudamericano Femenino. Women's volleyball is a popular sport in Peru (Silver medal in the 1988 Summer Olympics, Runners-up in the Volleyball World Championship, and 14 times South American Champion). Tennis, Surfing and Rugby in Peru are a minor, but growing sports. Peru has a varied cuisine with ingredients like maize, tomato, potatoes, uchu or Ají (Capsicum pubescens), oca, ulluco, avocado, fruits such as chirimoya, lúcuma and pineapple, and animals like taruca (Hippocamelus antisensis), llama and guinea pig (called cuy). The combination of Inca and Spanish culinary traditions, resulted in new meals and ways of preparing them. The arrival of African and Chinese immigrants in the 19th century also resulted in the development of Creole cuisine in the city of Lima, where the vast majority of these immigrants settled. Some typical Peruvian dishes are ceviche (fish and shellfish marinated in citrus juice), chupe de camarones (a soup made of shrimp known as cryphiops caementarius), anticuchos (cow's heart roasted en brochette), olluco con charqui (a casserole dish made of ulluco and charqui), pachamanca (meat, tubers and beans cooked in a stone oven), lomo saltado (meat fried lightly with tomato and onion, served with french fries and rice) that has a Chinese influence, and the picante de cuy (a casserole dish made of fried guinea pig with some spices). Peruvian food can be accompanied by typical drinks like the chicha de jora (a chicha made of tender corn dried by the sun). There are also chichas made of purple corn or peanuts. ^ Martin, Gerald. "Literature, music and the visual arts, c. 1820–1870". In: Leslie Bethell (ed. ), A cultural history of Latin America. Cambridge: University of Cambridge, 1998, pp. 3–45, 39. ^ a b Gerald Martin, "Narrative since c. 2009", pp. 151–152, 178–179. ^ Jaime Concha, "Poetry, c. 1920–1950", pp. 250–253. ^ For example, Mariátegui, José Carlos, Siete ensayos de interpretación de la realidad peruana, Ediciones Era, S.A. de C.V., 1979; originally published 1928. ^ Gerald Martin, "Narrative since c. 1920", pp. 186–188. Phipps, Elena; et al. (2004). The colonial Andes: tapestries and silverwork, 1530-1830. New York: The Metropolitan Museum of Art. ISBN 1588391310. Dependencies not included. 1 Defined as a semi-autonomous territory.